Quite likely top of the I-Spy tip-off chart is friend Andy who first weighed in with one nearly opposite his home in Boyton before identifying one under construction in Melton. 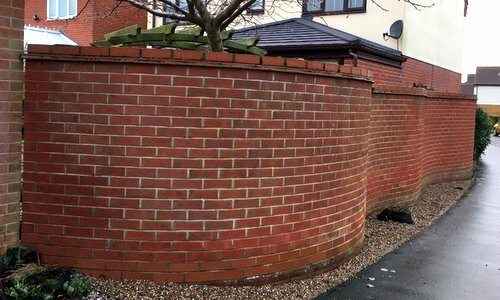 In popped a text recently saying "another drunken wall not on your list?" On Bredfield to Otley road, he said, at Debach end. Cannily and craftily, he then sent me a video showing a drive-by of said wall. That's class. Moat House itself is another former rectory, says Dr Bettley in the updated Pevsner guide, with two and half storeys and a wrought iron balcony. Gated modern entrance is less in your face than Coney Weston Hall but imposing enough. Facing the house, look left and there's our wall. Decent stretch of it stands back from the road guarding a lawn so we can't venture too close. Bricks seem old and the crinkle-crankle is, well, gentle at best. 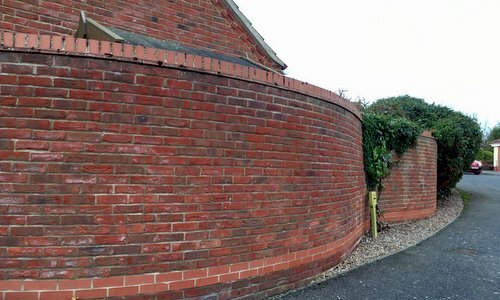 Includes an elegant archway and joins a more conventional straight wall nearer the main Woodbridge Road. Would be good to find out if it's an original. If it is, it ain't listed. Between Christmas and New Year, before we ticked off Hungate Lane and Coney Hill and Garden Lane, I'd suggested to the gang that we lunch at The Shed in Henstead. Reviews sounded good. Shame that, given the time of year, it was shut. Back in early November, after we ticked off White's Lane and Heritage Green and Badger's Holt, I suggested to the gang that we have coffee and cake at The Shed. Reviews still sounded good. Shame that, given the time of day, it was shut. Sure enough, to the south of the town and just off the main A145 is Richard Crampton (who he?) road. Nestled among the bung-a-low-roof-on houses is, as John says, a small piece of contemporary curvy wall. To be honest, it's much like other new-ish developments at Hollesley and Eye, especially with that striped skirt. Anyway, another one done. Cheers, John. New year, old walls. 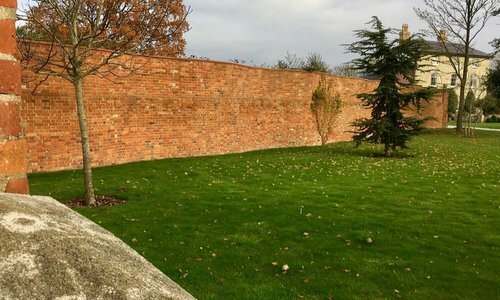 After unsuccessful forays visiting nearby Redgrave and Botesdale, good old-fashioned police work (a surname and a couple of phone calls) finally brought home one of the famed Rickinghall walls. 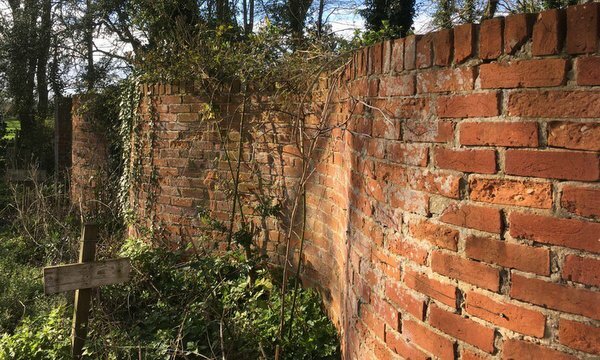 Owner Sue most kindly granted us a viewing of her "early C19 red brick crinkle-crankle wall, about 4 metres high with rounded coping", according to Historic England. Hear that? Four flippin' metres. 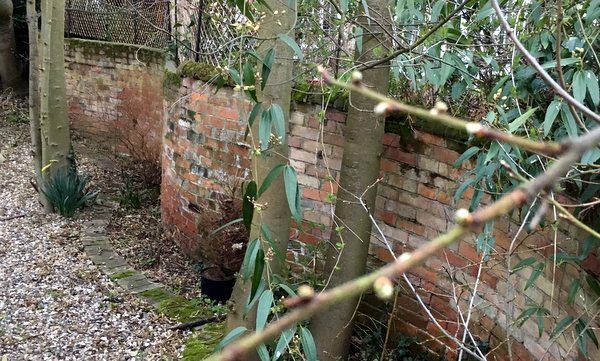 That's a heckofa lot of bricks right there, weaving its stately way along the garden. Unlike a number of other older examples, it's now naked and all the better for it. 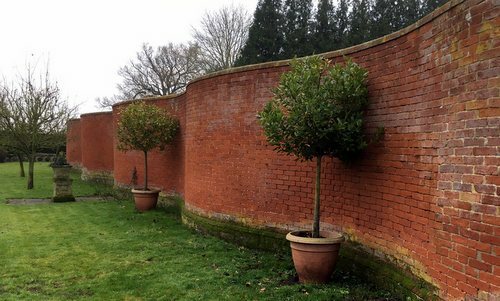 Not quite done yet, we also paid homage to the half-height crinkle-crankle wall to the rear of the garden. Leaning buttress here, leaning buttress there, and regal in its own right although rather dwarfed by its double-height big brother. Thank you, Sue. Trying to track down Pevsner's Grove House back (now White's Lane) in Oct 2016, "a lady at Kessingland library" proved mighty helpful and directed me towards Heritage Green and Badger's Holt. In a very bad show of form, I forgot that lady's name. 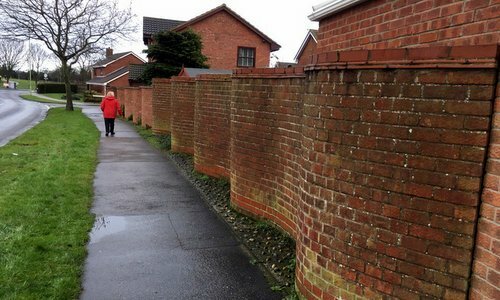 That lady is Jill Walker who now deserves a mention in bold lettering 'cos she sent me a follow-up email last week with a whole bunch of modern crinkle-crankle wall locations. Coney Hill in Beccles? Done, ditto the above mentioned duo in Kessingland, thanks to Jill's earlier tip-off. Excitingly, though, her list cited a wealth of walls in Carlton Colville. Only other trip thus far to a CCCC (thanks, Mum) had been to the splendid example at The Old Rectory. First stop on a dank Sunday was "in the vicinity of the play area on Deepdale" (cheers, Jill) where can be found a pair of crinkling bulges of precisely my height. Hard to ignore that lamppost. Still on Deepdale, we passed Coplow Dale and Nidderdale before taking a left into Colsterdale. Not a name I know, Colsterdale is apparently part of the Yorkshire Dales. Reminds me that once, visiting a small town in that area, I spotted a local discount shop called Yorkshire Deals. Boom! Here be another identikit contemporary example, this one albeit with slightly more subtle crinkles and crankles. Same height, same brick. Next up was nearly a mile away on the other side of the A1145. Be gone, dales. To further quote Jill, "think there are at least a couple along here." Off Elm Tree Road opposite Rosedale Park and into Ashburnham Way. There it is, I said, pointing to the right and pulling over to park. Getting out, I realised that there were bendy walls on both sides of the road and that, in fact, one stretched for a good 50m or so. Nicely weathered, too, and possibly comprising two conjoined parts. Pretty happy with that, we got back into the warmth of the car and drove along the rest of the road. Look, I said, another wall. And another. And yet another. I hereby decree that Ashburnham Way in Carlton Colville has the most crinkle-crankles in the land. The distinctive wavy form of the wall is characteristic of the locality and was a deliberate design feature when this large, phased housing development was planned in the early 1980’s with the aim of adding variety to the built form, particularly along the primary traffic 59 routes, as a means of preventing the streetscape from appearing bland and repetitive. 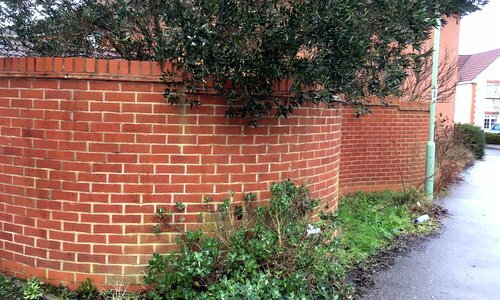 The applicant is to be applauded for recognising and appreciating the public benefit of retaining this design feature, rather than simply requesting to replace it entirely with a new straight wall or fence which would have been a much cheaper option, albeit inferior in design terms. It is noted that some other properties in the area have done just that (not all with the benefit of planning permission) and that is causing a steady erosion of the character in the general vicinity of the site which should be addressed whenever the opportunity arises, as advocated by policy DM02. Oh yeah, "variety to the built form" is what we're all about. After I queried this, the owner suggested that I could try Brampton Old Hall. BOH, as we shall call it, is a listed farmhouse on the moated site of the former manor hall. 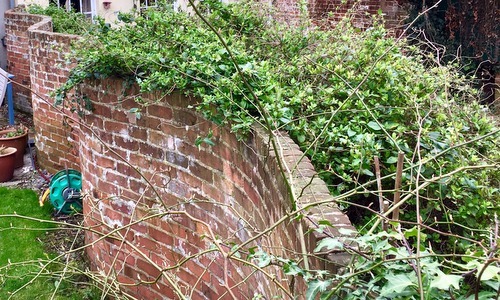 Still nothing about any wall, though, in the Historic England listing description. Which is when Ni Gooding, a local artist living nearby, came up trumps. Yes, he said, there's a crinkle-crankle wall there. You can walk past it since it's on a public footpath. Result! Following the bridleway sign one chilly Sunday afternoon, we approached the Old Hall, former home of the recently deceased Jim Prior, aka Baron Prior of Brampton. Can't miss the sly serpentine to the left which winds away at waist height before shooting up to double that altitude, continuing to wander in and out before disappearing around the corner. Looks like it's been there for a goodly time, topped with mossy spots, but hard to tell its age. Like it. ...a second location in Boxford. The one you have is Church Street. This is Swan St.
Not knowing who lives (if anyone) at number 33, I spoke to a chap at the butcher's next door. Crinkle-crankle? What's that? No, I don't know of anything like that around here. Undeterred, I ventured out with a full car, parked by the village stream, and strolled along Swan Street. Past the butcher's (shut by mid-afternoon), I took a left between two houses and found a shared driveway to the left giving access to various properties. Wandering down there, nobody around, I found it, a medium height serpentine dividing two houses. Couple of crinkles, couple of crankles, and no topping. I didn't venture in to the garden -- that would be wrong -- but seemed reasonably old too. You could live in Boxford your whole life and not know it was there. Tip of the hat to cuz Marts. A message left here, a message left there, then current owner Tom called me and was enormously kind in inviting me (and Mum) around. So there we were on a late Friday afternoon tramping through Tom's place to admire his stretch of the quirky wall. Shoulder height, it winds its mossy-topped way beyond his plot of land. beyond. Appeared to me that Tom has more of the wall than The Old Manse next door. Georgian, according to the listing. Let's take their word for it. Big tip of the hat to top man Tom. 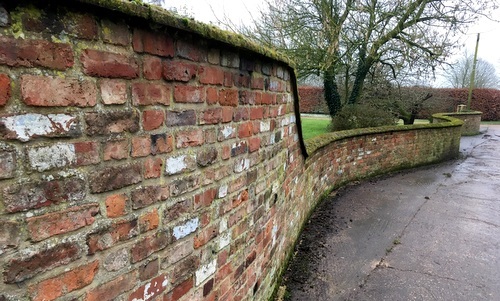 Doing my detective work for what turned out to be Brampton Old Hall, I was tipped off by the parish council clerk about another wall in the village. There's an example at Dog Cottage at London Road, said Tracey. That's right, a horse. I expected a reasonably small serpentine similar to Richard's at Boyton. Not so. This is a good six-feet tall with a bunch of ins and outs, a ninety degree turn and a break. Hardly a weekend's casual work, I'd say. Sure, bits of it aren't in peak condition but I'd be mighty proud if it was sitting in my back garden. Cheers, John!